A home energy audit is the first step to assess your home's energy use. It will help you determine where your house is losing energy and money – and how you can correct problems. You can perform a simple energy audit yourself, or have a professional energy auditor carry out a more thorough audit. You can save typically 5 to 30 percent on your energy consumption by making upgrades from home energy audit. Follow these steps to conduct a home energy audit yourself. Do "walk-through" of your home to look for energy loss. Make a checklist of problems you find. It will help you prioritize your upgrades. Locate air leaks by looking for gaps along the baseboard or flooring and at junctures of walls, ceiling, and windows. Feel for air flow through electrical outlets, switch plates, window frames, baseboards, weather-stripping around doors, fireplace dampers, attic hatches, and wall- or window-mounted air conditioners. Look for gaps around pipes and wires, electrical outlets, foundation seals, and mail slots. Check to see if the caulking and weather stripping are in good condition. If any windows and doors can rattle, the movement indicates a probable air leak. If you can see daylight around door and window frames, your home is losing energy. Seal with caulking or weather stripping. Consider replacing your old windows and doors with newer, high-performance ones. If too costly, install plastic sheets over the windows. Having trouble detecting air leaks? Shut all windows, exterior doors, and flues. CAUTION: Breathing air mixed with exhaust fumes from appliances run on natural gas, fuel oil, propane, or wood can be deadly. When sealing your home, always be aware of the dangers of indoor air pollution known as "backdrafting." Be certain the appliance has an adequate air supply. Generally one square inch of vent opening is required for each 1,000 Btu of appliance input heat. When in doubt, contact a ventilation contractor. Inspect outside your home in all areas where two different building materials meet. Plug and caulk holes or penetrations for faucets, pipes, electric outlets, and wiring. Look for cracks and holes in the mortar, foundation, and siding, and seal them. Check the exterior caulking around doors and windows, and seal tightly. Check insulation. Reduce cooling loss through the ceiling and walls with recommended insulation levels. Older homes may not meet today's standards. To avoid fire hazards, never cover recessed light fixtures with insulation. Allow a 3-inch space around these fixtures, unless the fixture is IC (insulation covered) rated. When inspecting the roof above the rafters, check to see if there is a vapor barrier under the insulation. The vapor barrier might be tar paper, craft paper attached to fiberglass batts, or a plastic sheet. If there does not appear to be one, consider painting the interior ceilings with vapor barrier paint to reduce water vapor passing through the ceiling. Moisture can reduce the effectiveness of insulation and promote structural damage. Make sure that the roof vents are not blocked by insulation. Seal any electrical boxes in the ceiling (from the inside) with flexible caulk and then cover them with the recommended insulation. Check a wall's insulation level by selecting an exterior wall and turn off the circuit breaker or unscrew the fuse for any outlets in the wall. Make certain the outlet is not "hot" by testing it with a lamp or radio. Remove the cover plate from an outlet and gently probe with a screwdriver. If you encounter a slight resistance, you have some insulation there. Unfortunately, this method cannot tell you if the entire wall is insulated, or if the insulation has settled. Only a thermographic scan (by professional auditor) can do this. Maintain heating/cooling. 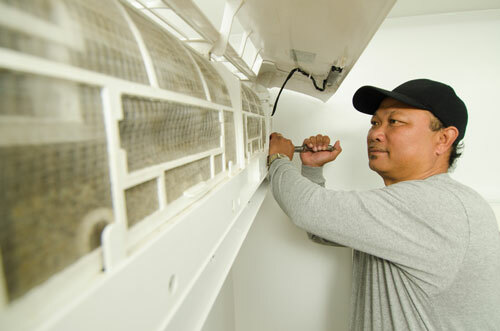 If you have a central ducted or ductless air conditioning, replace your filters once every month or two, more often during periods of high usage. Have a professional check and clean your equipment at least once a year. Check your duct work to reduce air leaks, and seal with metal-backed duct tape. Check lighting. Examine the wattage size of all the light bulbs in your house. You may have 100 watt (or larger) bulbs where 60 or 75 watts would do. Consider buying light-emitting diode (LED) bulbs. Most professional energy audits include a walk-through like a do-it-yourself audit, but with greater accuracy. Another advantage of professional audits is that they can provide energy-conserving measures at the time of the audit, so your payback begins immediately. Make a list of any existing problems like condensation or uncomfortable rooms. Have copies or a summary of the home's energy bills. What is the average thermostat setting by season? How many people live here? Is every room in use? Your answers may uncover some simple ways to reduce your energy consumption. Walk through your home with the auditors as they work, and ask questions. They may also use equipment to detect sources of energy loss, such as infrared cameras, AC efficiency meters, and surface thermometers. Thermographic inspections detect thermal defects and air leakage. Thermography measures surface temperatures by using an infrared camera. Images record the temperature variations in your home and help the auditor determine whether insulation is needed. They also serve as a quality control tool, to ensure that new insulation is installed correctly. 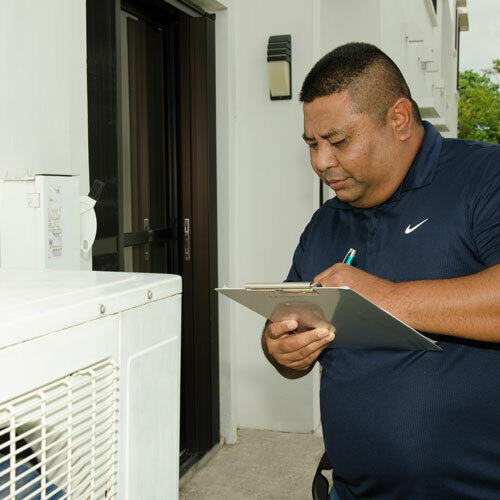 The Guam Energy Office provides a free weatherization program for income eligible citizens. Contact the Guam Energy Office at 548 North Marine Corps Drive in Tamuning or call (671) 646-4361. Ask them about their weatherization program. More information about how to apply is on their website at www.guamenergy.com. Get at least three references, contact them, and ask if they are satisfied with the auditor's work. Make sure that they conduct thermographic inspections, or contract with another company who does.